How Do SchoolSite Councils Work? 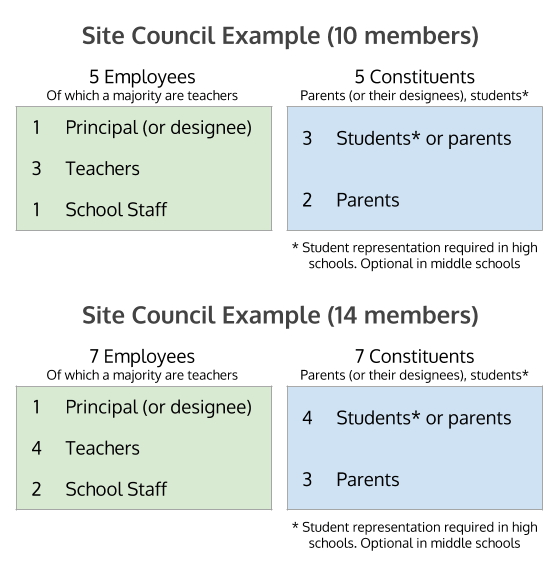 What is a SchoolSite Council? Virtually all schools in California have a schoolsite council (SSC), a committee of teachers, parents, students and school staff that works with the school principal to plan for the needs of the school. Who sits on a site council? Can students sit on schoolsite councils? How many members on a SchoolSite Council? Are school site councils elected? How are site council bylaws created? How long is the term of service on a site council? How is a site council different from an ELAC? Is my school required to have an ELAC? Are schoolsite council meetings public? Do site councils have extra duties in low-performing schools? Thinking of a run for school board? Serve on a site council first. People who serve on the board of a school district usually serve on a site council first. Developing the SPSA is a good way to learn about the connection between an individual school and the school system. For example, as a part of its work, the schoolsite council must monitor the use of school district funds that are intended to benefit specific groups of students (including English learners and foster youth) and speak up if something needs to change. This oversight function is important in its own right, and it is also a key expectation underlying the state's Local Control funding system (see lesson 8.5 for more about LCFF). Once the plan (the SPSA) is approved by the schoolsite council, it is sent to the local school board for approval. School district superintendents are responsible for ensuring that each school's SPSA harmonizes with the school district's Local Control Accountability Plan (LCAP), which Ed100 demystifies in Lesson 7.10. In some school districts, SPSAs and the district LCAP are clearly consistent and tightly aligned. If that is not the case in your district, differences may be revealing. Beginning in 2019, the federal Every Student Succeeds Act (ESSA) requires each state to annually identify at least 5% of its lowest-performing schools for extra support and scrutiny. In these schools, the SchoolSite council has some additional responsibilities to go with the additional funds. See below for more about that. The membership of a site council is determined by law. In 2019, the law was changed: the new minimum number of members is ten, down from twelve. Classroom teachers must make up the majority of school personnel elected. In a ten-member site council at an elementary school, the members are typically: the principal, three teachers who work at the school, one other school employee, and five parents. Members are chosen by their peers — that is, teachers are chosen by other teachers, parents by other parents, and students by students. In secondary schools, the SSC must include student members (replacing some of the seats held by parents in elementary SSCs); in middle schools the law is silent, which suggests SSCs may include student members. In schools with fewer than 300 students the council can be smaller. Sometimes community members may take the place of a parent if chosen by parents. The State Board of Education has the authority to waive requirements of the California education code, and it has approved waivers related to the composition of site councils, for example to permit one site council to represent more than one school. The rules are a bit different for small schools with fewer than 300 students. Those requirements aside, schoolsite councils have great latitude in how they operate. They generally create bylaws to outline their operating procedures, including the meeting schedule, who is allowed to serve, the election schedule, and term length. The SSC may form committees to work on specific topics, such as student engagement or truancy. Schoolsite councils may also elect a president and vice president to organize and lead the meetings, and a secretary to record the meeting’s minutes. (The Sonoma County Office of Education provided a useful example in 2016. The guidance about SSC membership is out of date, but the sample meeting agendas and minutes are still helpful). Council members generally serve two-year terms with half of the members beginning in even years and half in odd. The staggered terms lend stability to the council, allowing new members to acclimate. Most larger school districts provide trainings, templates and other guides. SSCs and ELAC membership can overlap. Any school that has at least 21 students who are English Language Learners (ELLs) must have an English Learner Advisory Committee (ELAC), which in many schools overlaps significantly with the SSC. The English Language Proficiency Assessments for California (ELPAC), as well as reclassification rates are common data points that can shed light on how well the school is serving this group. The SSC may also review attendance, out-of-class referrals, suspension data and student and family school climate survey data. Based on that data, the council sets goals and identifies the priorities and determines what programs, services, and other resources can help a student populations to reach these goals. They also monitor the expenditures that fund these programs and services. Schoolsite councils in these schools will need to write a SPSA that includes Comprehensive Support and Improvement requirements. (A template is available the Department of Education.) The plan needs to be informed by all Dashboard indicators, written after a comprehensive needs assessment that has identified resource inequities, and includes evidence-based assessments. Finally, they must implement and monitor the plan. Any school district that has a low-performing school must report the school’s CSI plan in a special section of the LCAP, which must then be approved and certified by their county board of education. What Kind of Recommendations Might a Site Council Make? Site councils can learn a lot from open conversations and a thorough review of data. Look carefully at the California School Dashboard. What is your school good at? What does it need in order to improve? Look at your school district's LCAP. Do the needs of your school match what the school district says it needs, or are your school's needs different? Equipped with insights from conversations like these, a site council might recommend buying academic support programs, hiring professional development experts in targeted areas, or investing in parent outreach strategies. For example, one council might recommend using funds to buy an online math intervention program to help students that underperform in math, while another might recommend hiring a writing specialist to strengthen teacher effectiveness. Another council might decide that strategies to reduce out-of-class referrals are important to improve school climate, or suggest a Literacy Night to increase parent engagement. Because school budgets are limited the decisions can be hard to make. Finally, the SSC monitors the implementation and effectiveness of the plans on an ongoing basis to make the most of what they have and keep the focus on improving outcomes for students. Try attending a meeting of your school's site council. You might like it! If you are interested in learning more about student achievement, school policy, programs and budgets, you might enjoy a term on your schoolsite council. Elections are typically held at the start or end of a school year. To find out more, talk to your school principal and attend a meeting. All schoolsite council meetings must be announced 72 hours in advance. The meetings are open to the public and anyone may attend. Although there is no requirement that PTAs and site councils overlap in membership, it helps. The two groups can share information and resources, and most certainly, communications. For example, PTA leaders can invite site council members to give updates at association meetings educating PTA members on the site council’s activities and the ways in which they are working to improve student achievement. Start on the council as a freshman or sophomore. Read Ed100 and you'll be ready. Serving on the site council is a great leadership opportunity that students — especially freshmen and sophomores — should take advantage of. In many schools, this important position is little-known. The selection process varies from school to school. If it sounds interesting to you, ask your principal about it. Start taking the lessons on Ed100 — in English or in Spanish — and earn your graduate certificate. It's the fastest way for you to become every bit as knowledgeable as the parents you'll be serving with. As a student member of your school's site council, you will get to know highly motivated and influential parents, teachers and staff. You will gain authentic leadership experience. Students in this role work collaboratively, learn about data, meet students and teachers from other schools and experience how decisions are made, matching resources with needs. Your voice and your school experiences are vitally important, and by serving on the site council you can help shape and improve your school. Many times, service on the site council will fulfill a community service requirement. It can also prepare you as a candidate for a seat on the school board, a youth commission, or even statewide office. So, get involved! You never know where it might take you. 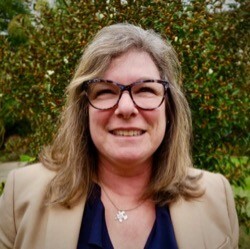 Leslie Reckler is President of the Bayside Council of PTAs, the umbrella organization that serves the 30+ PTAs in the West Contra Costa and John Swett Unified School Districts. She's the mother of two and a passionate advocate for public education. Great summary of SSC! I am going to share with my district's LCAP PAC and DELAC committees.